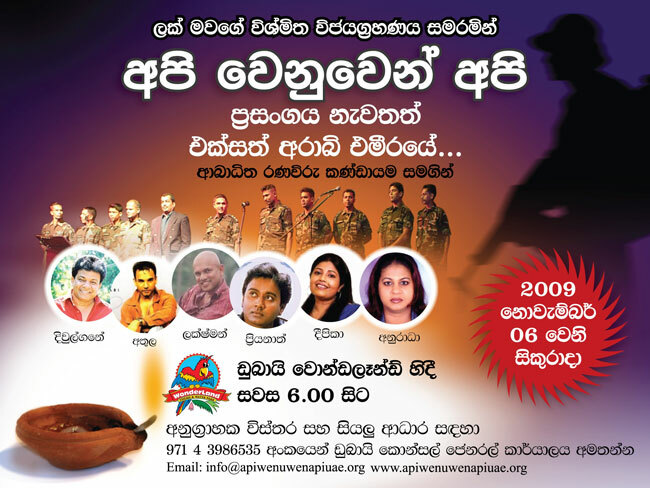 The Api Wenuwen Api musical event organized by the Sri Lankan Consular General's Office at United Arab Emirates will take stage on 06th November, for the second successive year. The musical event organized in aid for the welfare of war heroes is scheduled to show case at the 'Wonderland's', theme and nature park in Dubai, sources at the Consular's office said. Prominent artists from the Sri Lankan music industry including Athula Adikari, Dewulgane, Laxman, Deepika and Anuradha will take stage with the Army musical group, the sources further said. On directions of the Ministry of Defence, PD FLY Marine Institute has initiated a boat service providing general public with an opportunity of a boat ride at the Bere Lake. Chairperson of the Ministry of Defence SVU, Mrs Ioma Rajapaksa was the Chief Guest present at the occasion. 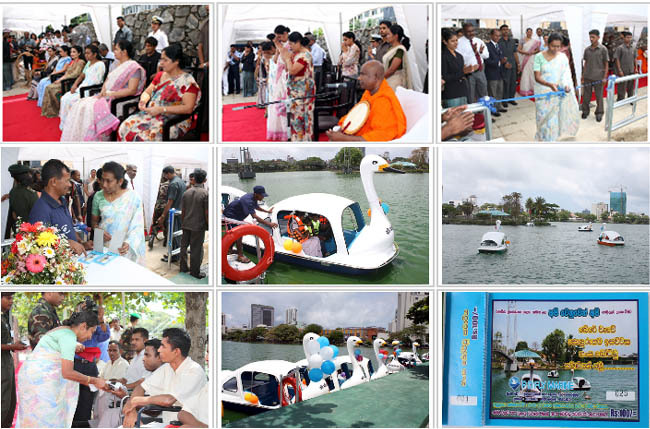 The boat service was officially launched with the issue of the 1st ticket by Mrs. Ioma Rajapaksa. According to SVU sources, 67.5 % revenue from sales of each ticket will be credited to the Api Wenuven Api Fund. Ten leisure boats were put on service with ensured safety for the riders. Chairpersons of three Forces Seva Vanitha units including Chairman of Civil Security Force Seva Vanitha Branch and senior military personnel were also present at that occasion. 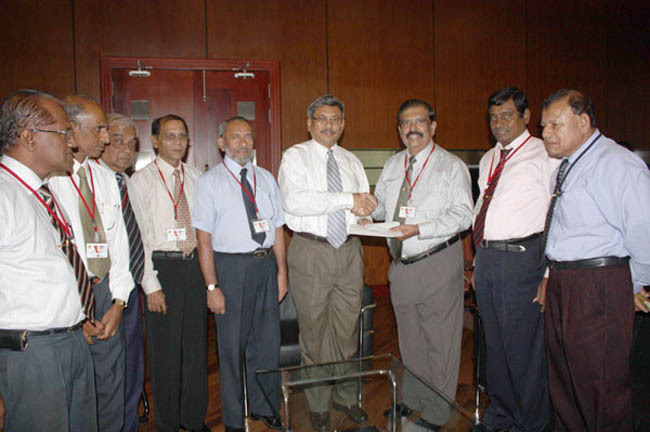 The Sri Lankan Consumer Co-operative Societies' Federation (COOPFED), made a donation worth of Rs. 98,896.08/= for the Api Venuwen Api fund on Friday (Sep 18). Mr. U.K.D. Palitha President of COOPFED presented the cash cheque to Mrs. Indu Rathnayake , Senior Assistant Secretary(Administration) at the Ministry of Defence premises this morning. Members of COOPFED had contributed their day's pay for the donation which according to Mr. Palitha, "a gesture of gratitude for the great sacrifices made by war heroes liberating the country from terrorism". Mr. D.S..K Pathirana CEO, N. Jayasinghe Arachchi Financial Manager and Mr. Shantha Laxman Karunarathne Manger of COOPFED were also present at the occasion. Central finance Company PLC handed over a cheque worth of Rs. 3,272,500 to Secretary Defence Mr. Gotabaya Rajapaksa yesterday (14th Sep). This contribution is for the lease of three wheelers under the "CF Viru Diri Leasing" scheme. According to the records, CF has leased 800 three wheelers in July 2009 and 906 three wheelers in August 2009 under the "CF Viru Diri Leasing" scheme. CF contributes Rs. 2500 per three wheeler they lease as agreed upon, to the "Api Wenuwen Api" fund, and had already paid Rs. 1,000,000 as advance contribution to the fund. Mr. Ravindra Rambukwella (Director Marketing), Mr. Prasanna De Silva (General Manager - Credit) and Mr. Chandika Hettiarrachchi, (Assistant General Manager - Credit) representing the Central Finance Company PLC, also participated at the occasion. Employees of Public Service Commission (PSC) contributed their one day salary to strength the "Api Wenuwen Api" housing fund this morning, 14 Sep. The cheque worth of 90,317.00 rupees was handed over to Secretary Defence by Additional Secretary Mr N Ariyadasa Coorey. Assistance Secretary (Finance) Mrs K.A Aravindi De Silva also participated at the occasion. Central finance Company PLC handed over a cheque worth of Rs. 3,272,500 to Secretary Defence Mr. Gotabaya Rajapaksa yesterday (14th Sep). This contribution is for the lease of three wheelers under the "CF Viru Diri Leasing" scheme. According to the records, CF has leased 800 three wheelers in July 2009 and 906 three wheelers in August 2009 under the "CF Viru Diri Leasing" scheme. CF contributes Rs. 2500 per three wheeler they lease as agreed upon, to the "Api Wenuwen Api" fund, and had already paid Rs. 1,000,000 as advance contribution to the fund. Sri Lankan community in Australia made a financial donation to build a fully equipped library at the "Api Wenuwen Api" housing scheme, Ipologama. A cheque worth of Australian Dollars 10,000.00 was handed over to Secretary Defence Dr Gotabaya Rajapaksa by Mr Gamini Perera in a function held at the Defence Ministry premises this morning, 14 Sep. The fund rising for the project to build the library at the "Api Wenuwen Api" housing scheme, Ipologama was initiated by Mr Gamini Perera and coordinated by Mrs Himali Karunasena. The employees of the Air port & Aviation authority have made their contribution to strength the 'Api Wenuwen Api' housing fund donating 14 million rupees . 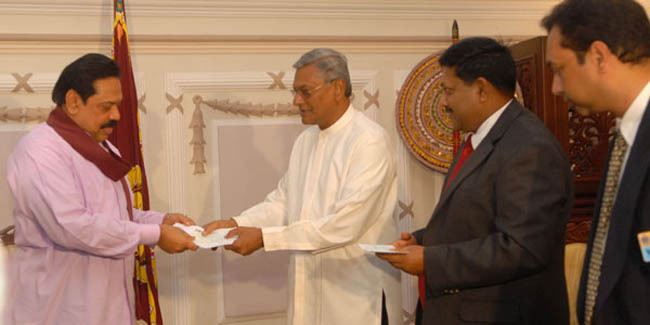 The cheque was officially handed over to HE President Mahinda Rajapaksa at the temple trees on September 03. Minister Chamal Rajapaksa, Chairman of Air port & Aviation authority Mr. Presanna Wikramasooriya also participated in the occasion. The Api Wenuwen Api Fund is a collaboration between The Ministry of Defence and the Central Bank of Sri Lanka to build 50,000 houses for the serving three Forces and the Police personnel. The Society for Peace, Unity and Human Rights in Sri Lanka(SPUR) an organization of Sri Lankan expatriates living in Australia and New-Zealand has donated a sum of A$ 13,000/= for the 'Api Wenuwen Api' housing project. 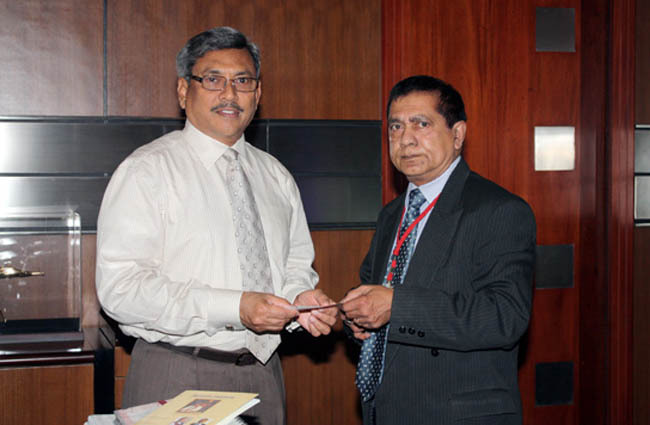 The cash cheque was presented by Mrs. Eranga Perera to Secretary Defence Mr. Gotabaya Rajapaksa at the Secretary's office on September 2nd. An awareness programme to raise funds for the 'Api Wenuwen Api' housing project is scheduled on 12th September including a food fair organized by the Australian Sri Lankan forum, said Mr. Pium Attanayake(Secretary of SPUR) speaking with our correspondent. "It is with great pleasure the Sri Lankan community in Australia has joined hands with expatriate Sri Lankans living around the world to support 'AWA', as a gratitude to our fallen war heroes and those injured in the mission to rid the motherland from the scourge of terrorism", he further said. The 'Api Wenuwen Api' is a Ministry of Defence initiated welfare project with the cooperation of the Central bank of Sri Lanka, facilitating construction of houses for war heroes. The project is phased over five years building 50,000 housing units for armed forced personnel. Sri Lankan expatriates in Baharain have contributed a sum of SLR 4,461,771.90 to the 'Api Wenuwen Api' housing fund. 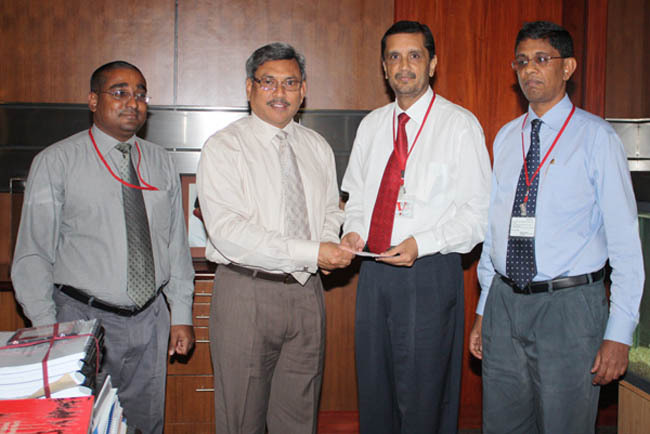 The donation was made through the 'Api Wenuwen Api' Bank of Ceylon A/C 7040000. The 'Api Wenuwen Api' is a Ministry of Defence initiated project with the cooperation of the Central bank of Sri Lanka, facilitating construction of houses for war heroes. The project is phased over five years building 50,000 housing units for armed forced personnel. SL Students of North Dakota State University contributes for "Api Wenuwen Api fund"
The Sri Lanka Student's Association of North Dakota State University, USA, has contributed for the 'Api Wenuwen Api fund', a project initiated under the Ministry of Defence facilitating construction of 50,000 houses for war heroes. 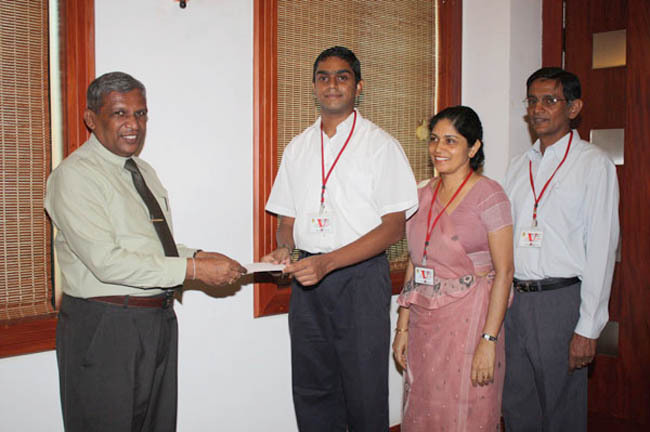 Student's representative Manic Madugalle presented the cash cheque worth of USD 1,300/= to Additional Secretary (Technical) Mr. B.K.U.A Wickramasinghe on August 21st at the MOD premises. Speaking with our correspondent, Mr. Madugalle said that the funds were contributed through savings made by Sri Lankan students. Mr. Chula Madugalle and Mrs. Prasanthi Madugalle, parents of Mr. Manic were also present at the occasion. Srilankans working at Hilton Hotel Abu Dhabi donated their one-day salary to the "Api Wenuwen Api" housing fund as to show their gratitude on war heroes made sacrifices for defending the motherland. The donation was made in a charm function held at the defence ministry premises on 19 August. 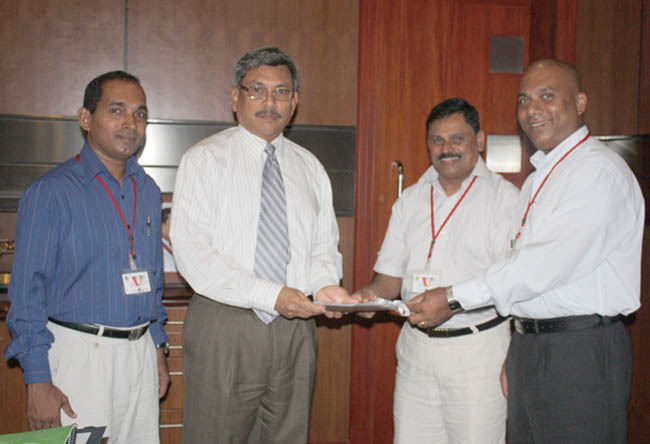 The cheque worth of 204,187.50 rupees was handed over to the Secretary Defence Mr Gotabaya Rajapaksa by Mr Ranjith Perera representing the Sri Lankan staff of the Hilton Hotel Abu Dhabi. Mr Ajith Gunawardena and Buddhi Gunawardena were also participated at the occasion. The Thurstan College OBU (Old Boys Union) has made a donation to strength the "Api Wenuwen Api" housing fund on August 19th. Chairman of the OBU Mr. Graetian Gunawardhena handed over the cheque worth of 2,157,054.00 rupees to Secretary Defence Mr. Gotabaya Rajapaksha in a charm fuction held at the ministry premises. Earlier, the OBU donated1,885,000.00 rupees to the housing fund and accordingly the Thurstan old Boys Union donated 4,042,054.90 to the "Api Wenuwen Api" housing fund established by the Ministry of Defence to build 50,000 housing units for war heroes. Principle of the Thurstan College Mr. Wimal Gunawardhana, Advisors of the OBU Bhathiya Seebert, Mr. Priya Paranawithana, Major General Dudley Perera, treasure of the OBU Mr. WDL Fonseka, secretary of the OBU Mr. D.M.D Goonawardhana also participated at the occasion. Ministry of Defence in Sri Lanka. Copyright © 2014 www.apiwenuwenapi.com. All rights reserved. pms-symptoms.net implantation bleeding symptoms - emotional and physical symptoms . Ringtones: Free mp3 ringtones for cell phones Nokia.